Brahmi plant, though originating from a humble background, possesses powerful regenerative elements that are highly recognized in Ayurveda & Indian tradition. Our deep treatment Brahmi Hair Mask binds the most vital characteristics of this wonderful herb in providing a natural strengthening conditioner for your hair. 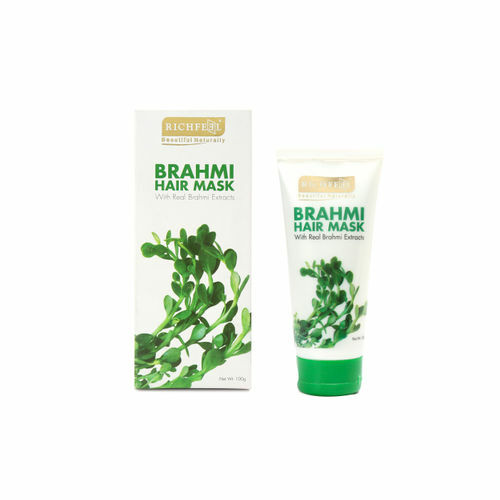 Apart from alleviating the usual hair dilemmas, the unique quality of the Brahmi ingredient relaxes your scalp and promotes healthy sleep. This in turn, supports the overall nourishment of your hair. Mother Nature knows what’s best for your hair and we’re happy to provide it for you. Ingredients Purified Water, Cetyl Alcohol, Light Liquid Paraffin, Amodimethicone and trideceth-12 and Citromonium Chloride, Stearic Acid, Glyceride Stearate and PEG-100 stearate, Glycerin, Perfume, Cetrimide, Bhringraj Powder, Methyl Paraben, Propyl Paraben, Shikakai Powder, Triethanol Amine, BHT, Amla Powder, Brahmi Powder, Kapor Kachari Powder. How to Use After shampooing, squeeze any excess moisture out of your hair, leaving it damp but not drenched. Apply 10 gms of the healing mask evenly through the lengths and ends of your hair. Leave it on for 10 to 15 minutes. Then rinse thoroughly with lukewarm water. Your hair will be left soft, manageable and shiny. For best results once a week.